zCover TypeOn pre-printed Language Keyboard protector is unique in having pre-printed letters on the cover, the layout of which perfectly coincides with that of the standard Apple MacBook US English Keyboard. With the protector snugly fitted to your keyboard, you won't be squinting again struggling to find the right key! Constructed from the zCover's high- quality silicone, zCover typyOn Pre-printed language keyboard protectors mold perfectly to your MacBook keyboard and keep the keyboard clean and smudge free. Being extraordinary durable and a perfect fit, they protect your Macbook keyboard without restricting normal typing and maintaining a clear view of the keyboard. 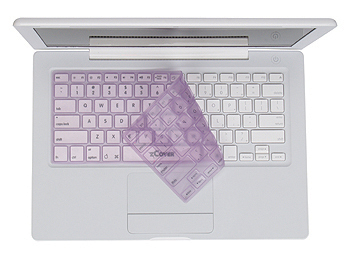 zCover typeOn Pre-printed language keyboard protectors are removed just as easily and can be washed for easy cleaning. 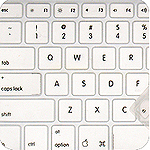 zCover TypeOn Preprinted Language Keyboard protector designed for Apple MacBook®. zCover TypeOn Preprinted Language Keyboard protector comes in a variety of colors: Ice Clear, Ice Blue, Ice Green , Ice Pink, Ice Purple and Ice Yellow. zCover TypeOn Preprinted Language Keyboard protector for Apple MacBook® retails for USD$24.99.